TIPERs: Sensemaking Tasks for Introductory Physics gives physics students the type of practice they need to promote a conceptual understanding of problem solving. 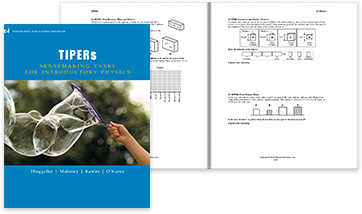 This supplementary text helps students to connect the physical rules of the universe with the mathematical tools used to express them. The exercises in this workbook are intended to promote sensemaking. The various formats of the questions are difficult to solve just by using physics equations as formulas. Students will need to develop a solid qualitative understanding of the concepts, principles, and relationships in physics. In addition, they will have to decide what is relevant and what isn’t, which equations apply and which don’t, and what the equations tell one about physical situations. The goal is that when students are given a physics problem where they are asked solve for an unknown quantity, they will understand the physics of the problem in addition to finding the answer.